My research interests focus on developing, validating, implementing and evaluating nutrition and healthy lifestyle programs for individuals and families. The goal is to help people make changes to their dietary patterns and decrease their risk of weight-related chronic disease, across all population groups – children, women in pregnancy, young adults and parents. I have a special interest in the use of eHealth and information technologies within my research. When I graduated from university as an Accredited Practising Dietitian, I was pretty sure I'd never need to do research. But it turned out that the best way to evaluate the significance of my role in the paediatric cystic fibrosis team at John Hunter Children's Hospital was to evaluate it in a clinical research project. Little did I know that this would lead me to life as a researcher and research mentor and leader of the largest group of dietitian researchers in the world. If I could have my way then everyone would have their own personal dietitian. As that is not likely to happen I will settle for using technology to novel and engaging ways, to connect people with expert nutrition advice, support and motivation. Healthy dietary patterns are your best insurance against developing chronic conditions like type 2 diabetes and specific diet-related cancers. By focusing on smart technologies to connect people with expert nutrition advice when they need it, I will lead my research team into the future to develop eating solutions that help people eat better, feel better and perform better. It will be a world where every person can have their own personal e-dietitian and get the sound nutrition advice and support they needed where and when they need it. Clare Collins is a Professor of Nutrition and Dietetics in the School of Health Sciences, Faculty of Health and Medicine and Deputy Director, Priority Research Centre in Physical Activity and Nutrition at the University of Newcastle. Professor Collins has published over 200 manuscripts and has supervised over 20 dietitians doing PhDs. 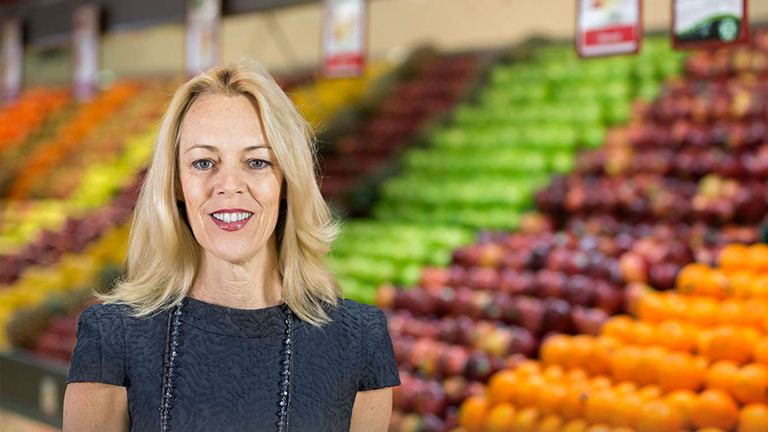 She created the online Healthy Eating Quiz that has provided real-time feedback on diet quality to thousands of Australians since 2012 and recently launched the online Australian Eating Survey that provides real-time feedback of dietary intakes compared to national recommendations. Professor Collins was a team leader on the systematic reviews for the Dietitians Association of Australia (DAA) that informed the revision of the 2013 NHMRC Australian Dietary Guidelines. She served on the Australia and New Zealand Obesity Society (ANZOS) council for 6 years, with 2 years as Vice President (2007-08). Professor Collins chaired development of DAA’s Best Practice Dietetic Guidelines for the Management of Adult Overweight and Obesity and led the University of Newcastle and DAA reference group updating these in 2011. She founded the Healthe@UON technology network at the University of Newcastle in 2012 and is currently an academic leader for the University of Newcastle’s Global eHealth Research and Innovation Cluster that is seeking to link research teams across the health, community and industry sectors. Professor Collins is also a Fellow of the Dietitians Association of Australian (DAA) and represented DAA in an international Practice Based Evidence in Nutrition collaboration with Dietitians of Canada and the British Dietetic Association (PEN). She has been a DAA media spokesperson for 15 years and conducted over 1200 media interviews. She was a clinical paediatric dietitian for 20 years at John Hunter Children’s Hospital, NSW.